Question: Whenever my contacts send a recording on WhatsApp I can't hear voice message on it, how can I fix this? I have an iPhone 8 running iOS 12. WhatsApp is one of the most popularly used iOS and Android messaging apps. But, as any other smartphone apps, it's far from perfect and has a few quirks. One of the problems that WhatsApp users may encounter is that WhatsApp voice message has no sound. This problem even occurs in iOS 12. We'll be exploring this issue and showing you some different ways to fix it. 1. Official Method to Solve "WhatsApp Voice Message No Sound"
We're first going to show you the official fix that WhatsApp suggests. Try this method before using any of the others. 1. Tap on the voice message to start playing it. 2. 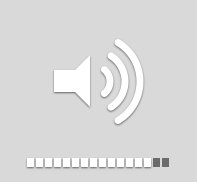 While the voice message is playing, press the "Volume Up" button to increase your device's volume. 3. After increasing the volume, play the media again. Not all iPhone users are aware that there are two sound settings - one for media and another for the iPhone's features (e.g. ringtones, notifications, etc.). Thus, this is worth checking. Another issue that you might have experienced is with your Bluetooth earpiece. This is usually not a WhatsApp problem and can be fixed with these steps. 1. Launch the "Settings" app and tap on "Bluetooth". 2. Tap on the info symbol next to your earpiece followed by "Forget This Device". 3. Reconnect the earpiece and try listening to the voice message again. By doing this, a fresh connection is established between your iPhone and Bluetooth earpiece. 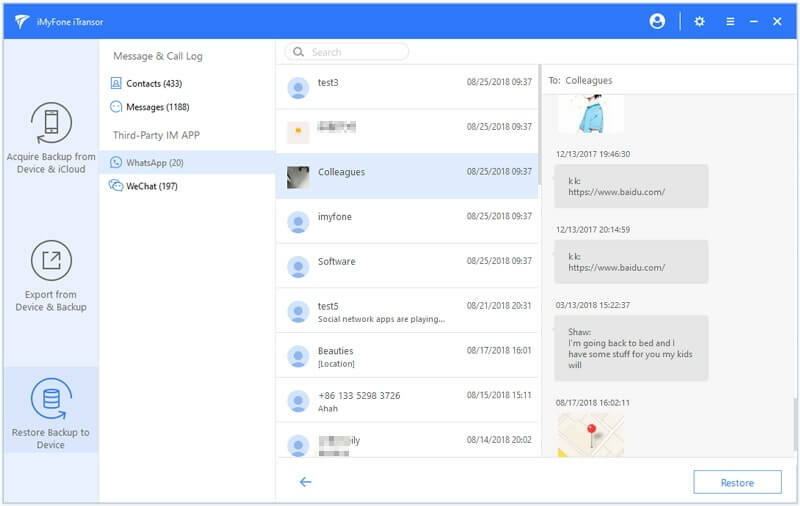 Selectively backup text messages, WhatsApp, and WeChat. 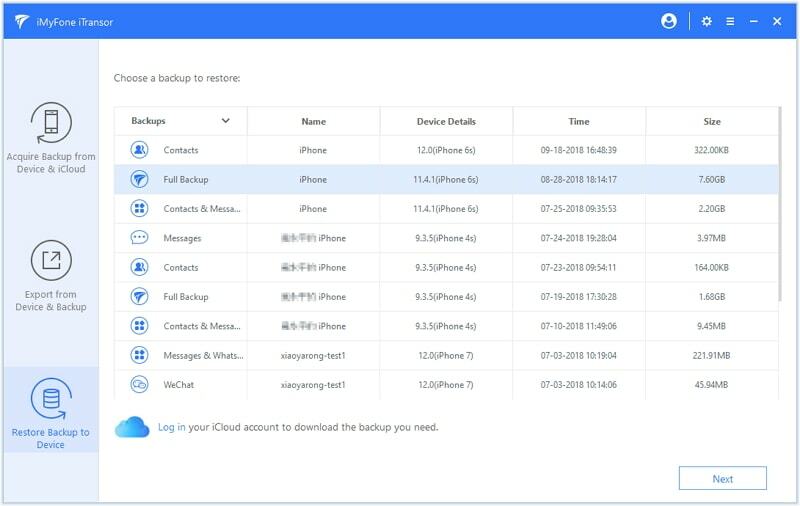 Restore backups to your iPhone without overwriting existing data. 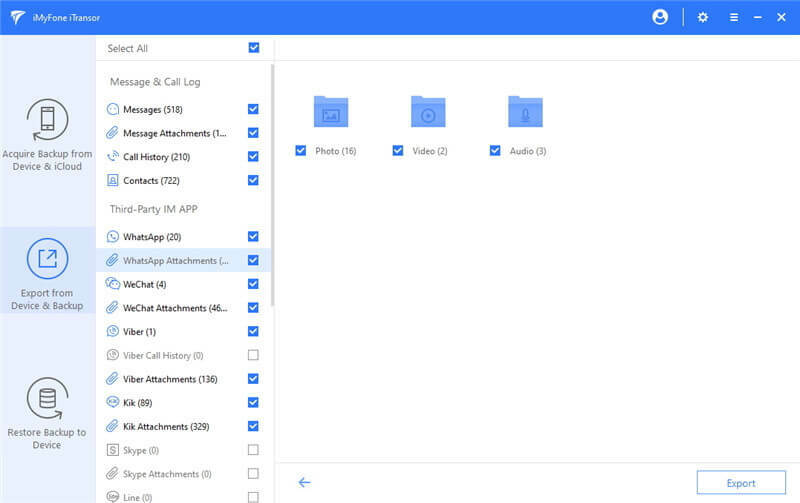 Extract data from your iPhone or a backup file. Restore backups from iTunes, iCloud, or iMyFone. Compatible with all recent iOS versions like iOS 12 and the newest iPhones. You can be assured that with this program you'll effectively fix the issues you're experiencing with WhatsApp. Follow this first method to export individual voice messages from WhatsApp to your computer. 1. 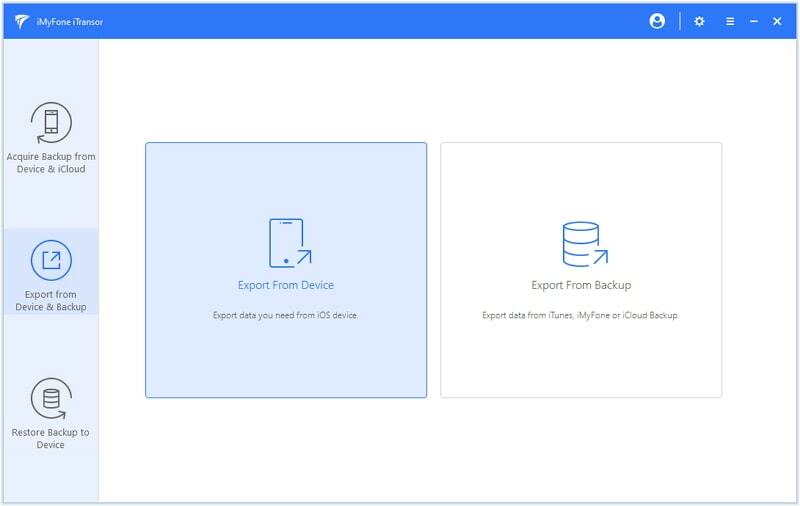 Open iMyFone iTransor, click on "Export from Device & Backup ", and choose "Export from Device". Connect your device with the computer. 2. Select "Export Data" and check the box next to "WhatsApp". Click "Next" to proceed. 3. After your iPhone has been scanned, click on "WhatsApp Attachments" and select the voice messages that you want to export. Click on "Export", choose a location to save the messages, and you're done. This can be useful if the problem is with your iPhone and the speaker has malfunctioned. Another option that iMyFone iTransor presents you is exporting WhatsApp voice messages from backups. The following method will explain how to export data from an iTunes backup. 1. 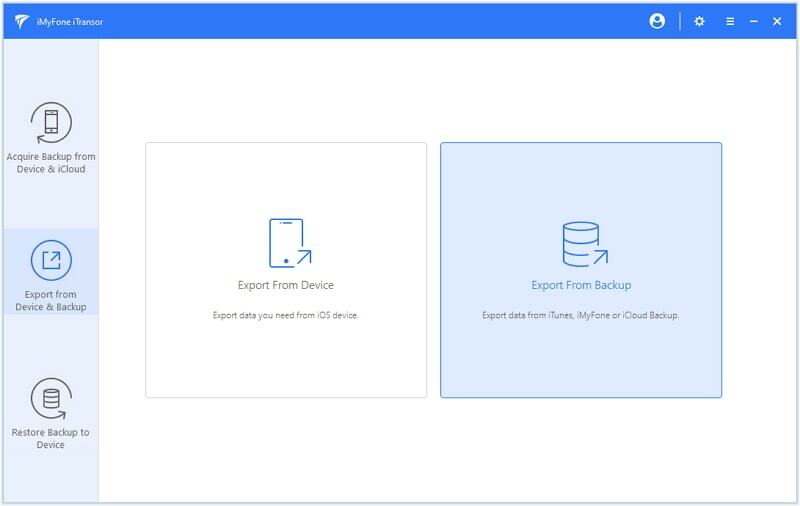 Click on "Export from Device & Backup" and choose "Export from Backup" . From the backup chart, choose the backup that you want to export WhatsApp voice messages from and click "Next". 2. Next, choose "WhatsApp" from the menu of data types. 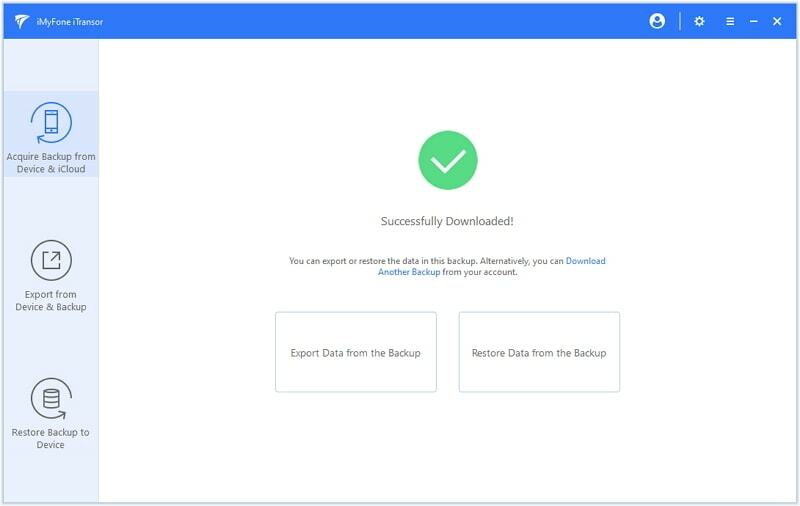 Click "Next" and the backup will now be scanned, and your WhatsApp data will be shown afterwards. 3. 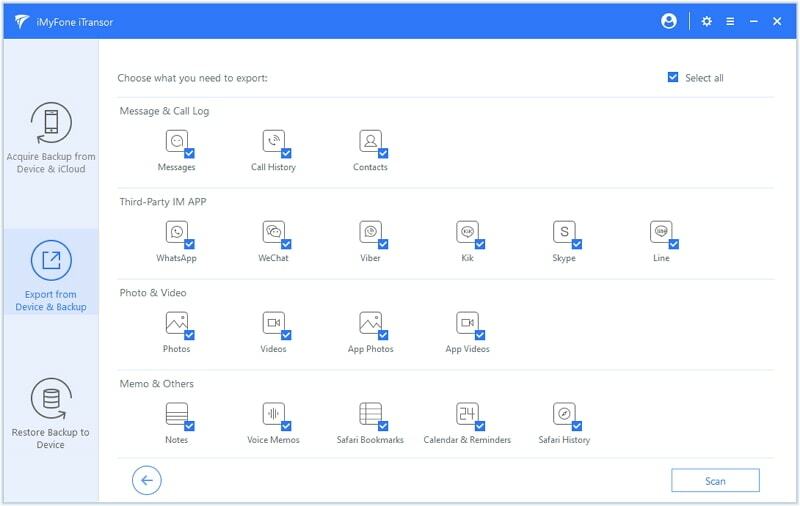 Simply browse the backup -> select the WhatsApp audio messages that you need -> click on "Export", and lastly choose a folder to save the data . 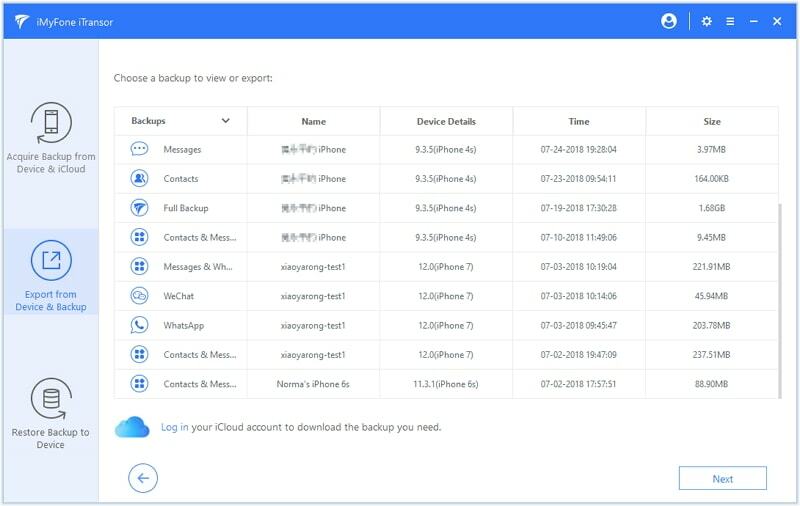 The steps used to export WhatsApp data from an iCloud backup are similar with these of iTunes backup, but you need to download iCloud backup first. 1. Choose "Acquire Backup from Device & iCloud" from the left panel, then click "Download iCloud Backup". 2. Enter your iCloud information as requested. After signing in, choose the iCloud backup to downloaded and click "Next". 3. The backup will be downloaded soon. Then you can go to "Export from Device & Backup", and export WhatsApp audio messages from the iCloud backup using the similar steps as iTunes backup. iMyFone iTransor not only helps when WhatsApp voice message won't play, but also helps when you need to transfer WhatsApp data to another iPhone or new iPhone without restoring an entire backup. One of iMyFone iTransor's features is backing up and restore only WhatsApp data rather than backing up and restoring the entirety of your iPhone's contents. This is much more efficient. 1. 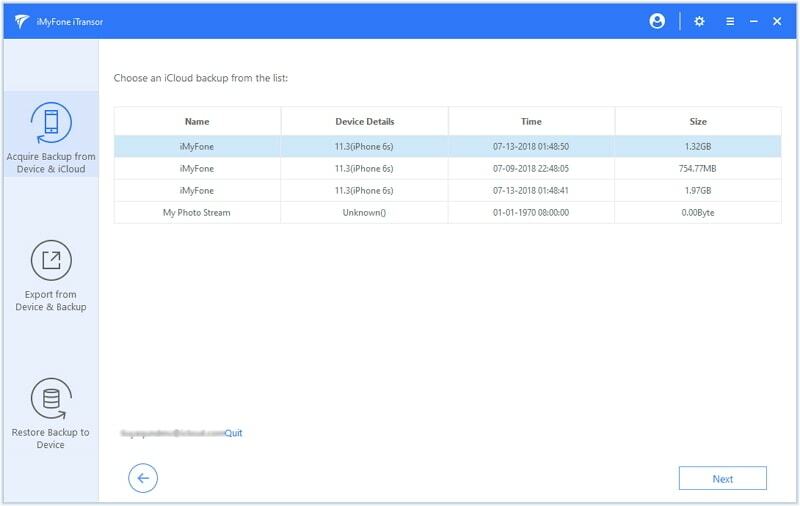 Launch iMyFone iTransor and click on "Acquire Backup from Device & iCloud" and choose "Back Up Device". Connect your iPhone using a lightning cable now. 2. Check the box next to WhatsApp and choose the location to store the backup files. Then click "Back Up". 3. After a few minutes, your WhatsApp data will be backed up. 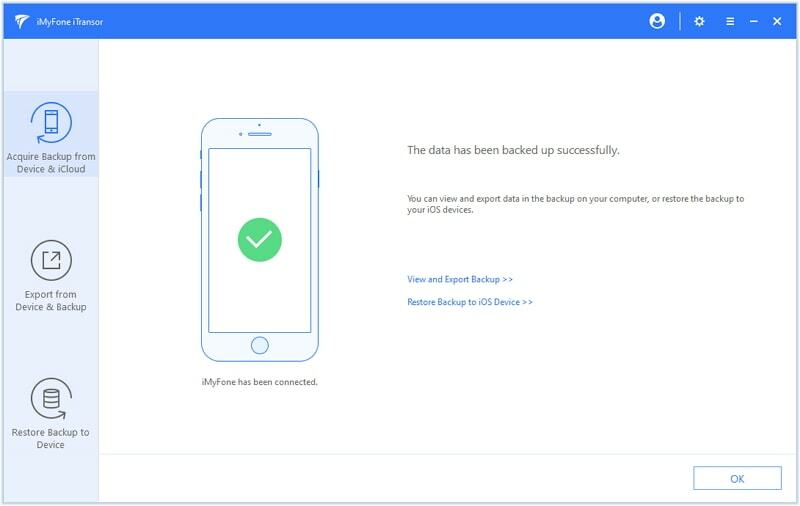 Please note that after you start to take the backup, you shouldn't disconnect your iPhone for any reason as this will significantly increase the chances of data corruption. Not only can this help you to work around the WhatsApp voice message no sound issue, but it's quicker than taking a full backup. Now that you have a WhatsApp backup available on iMyFone, you can restore the data whenever it's needed. You can also restore individual app data from an iTunes or iCloud backup. 1. Click "Restore Backup to Device" from the left menu and choose the WhatsApp backup. Then click "Next". 2. 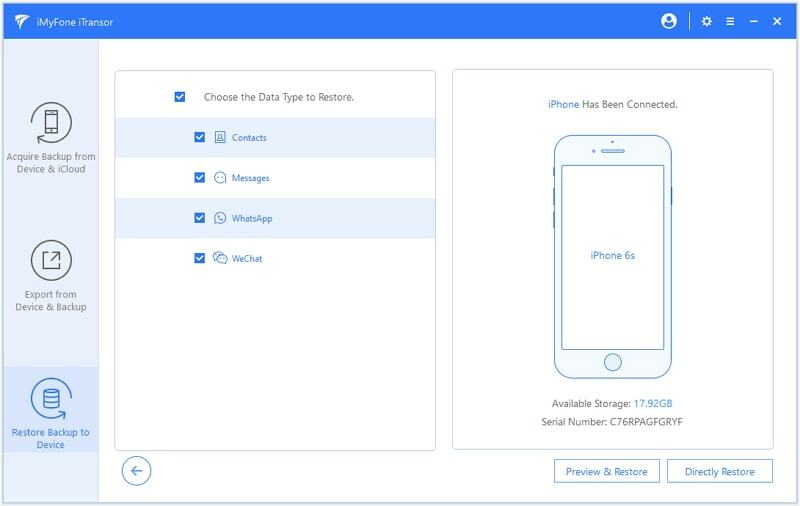 Connect your iPhone to the computer and click "Preview & Restore" if you want to preview the data before restoring. 3. Once the backup has been scanned, click "Restore". Choose "Merge" (merge the data with the existing WhatsApp data on your device) or "Replace" (replace the existing WhatsApp data on your device) from a pop-up. Within a few minutes, you'll find the WhatsApp messages on your iPhone. 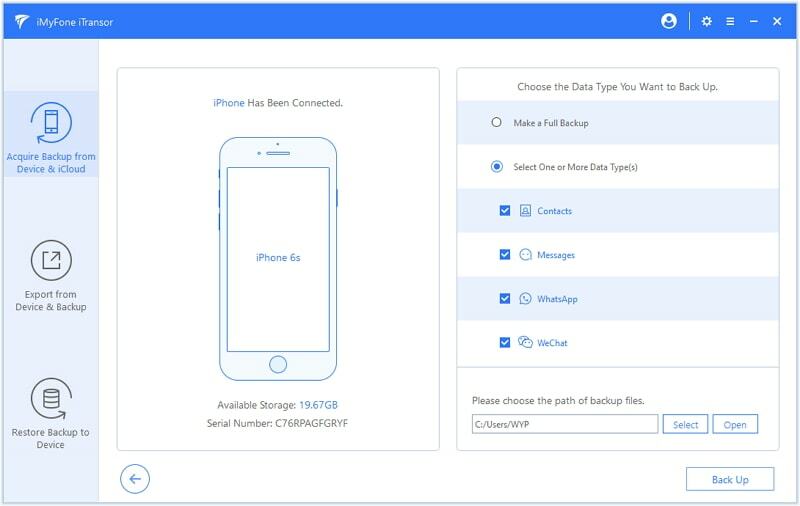 The benefit to using this method is that your existing WhatsApp data won't be overwritten, and the WhatsApp data will instantly be available on your iPhone. This tool is completely compatible with iOS 12. We're constantly seeing complaints of, "I can't hear voice message on WhatsApp", and we understand how frustrating it can be. It's our suggestion that you use this guide to fix the issue that you have and, if you can't fix it, use iMyFone iTransor to extract your voice messages and listen to them on a computer instead. If you have any questions or feedback on how this guide helped you, feel free to comment below!